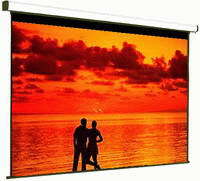 SI's Sensation Series Portable projection screens are simple and easy to use creating a quick and easy solution for any presentations or portable cinema. Flip out the stabilizing feet, extend the screen harness, pull up your screen and in less than a minute your screen is ready for action. Portable's are available in pull-up and pull down formats. 16:9 - 80", 92", 100", 106"
4:3 - 84", 100", 110", 117"